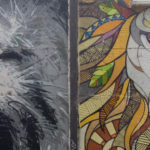 We’re back in the states after our month in Europe, and just now catching up on emails, the business and things like updating this blog. It was a fun trip and we are very grateful to have been able to take it, but it’s also good to get back into the swing of things here in the states. 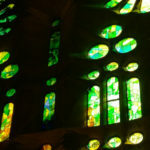 We didn’t work much while abroad so it was kinda like a “vacation” in the context of our new lives living on the road. 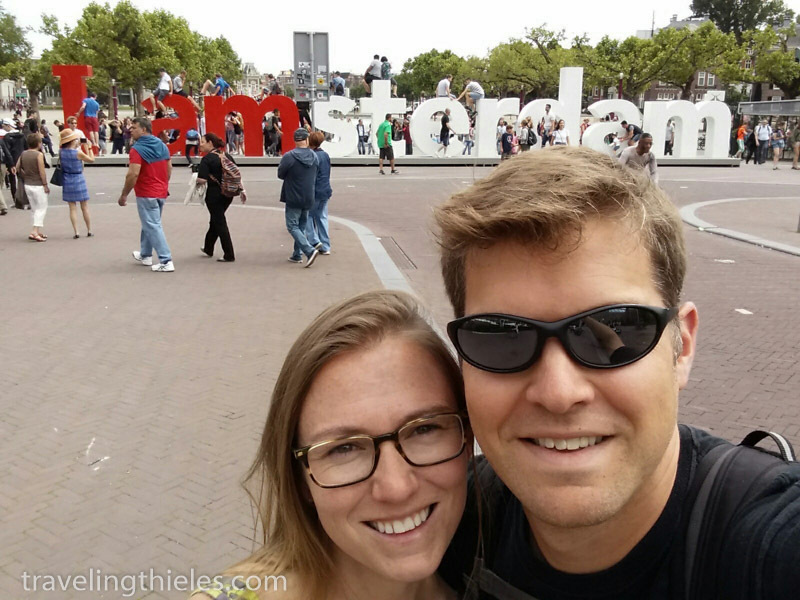 Our stay in Amsterdam was a relaxing six nights. All our hotel nights were free since we had a number of free night stay coupons with various hotel brands – earned from credit card signups, annual renewals and promotions – all set to expire in mid-2016. The downside however was that the free nights were with 3 different hotel chains, and we had to switch hotels twice during our visit. 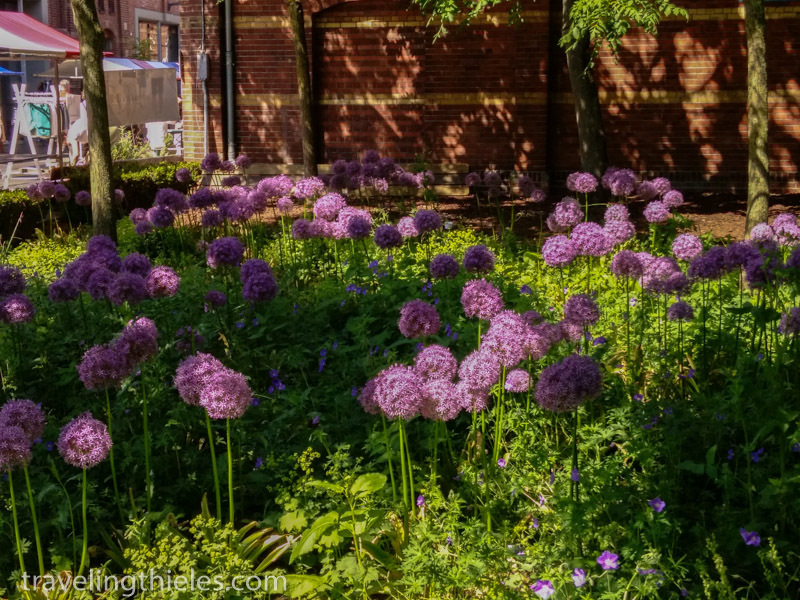 We stayed 2 nights each at the Crowne Plaza, the Hyatt Andaz, and the Radisson Blu. 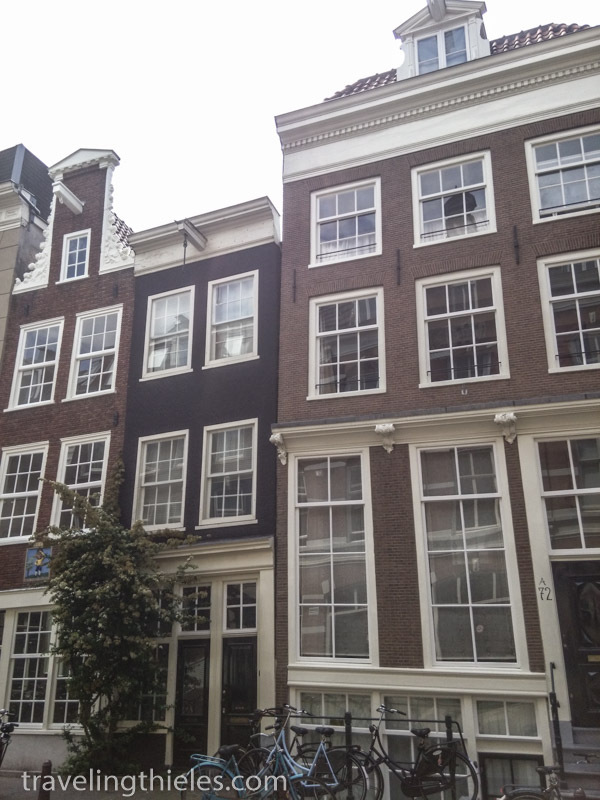 Amsterdam is a very expensive city for accommodation (these hotels ranged from $200-$500 per night) so it was a good use of the free nights. 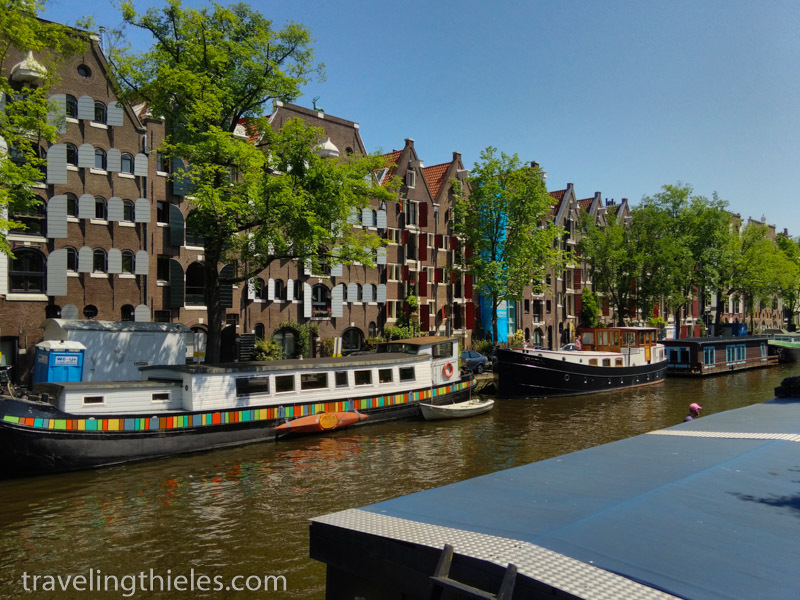 All the hotels were great but our favorite was probably the Andaz – it was probably the completely free mini-bar in the room that swayed us..
We took advantage of the small size of the Netherlands to take some daytrips from Amsterdam. 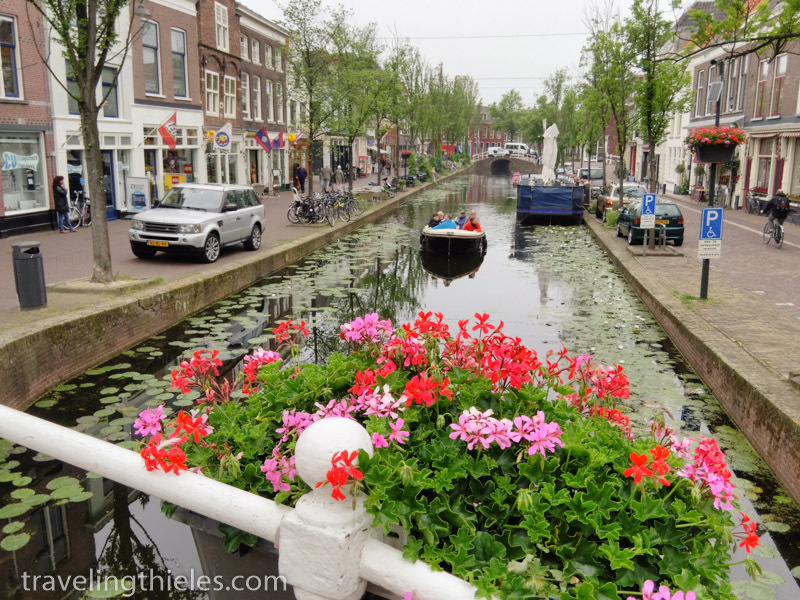 Our first stop was Delft, which we found to be a more quaint version of the capital. 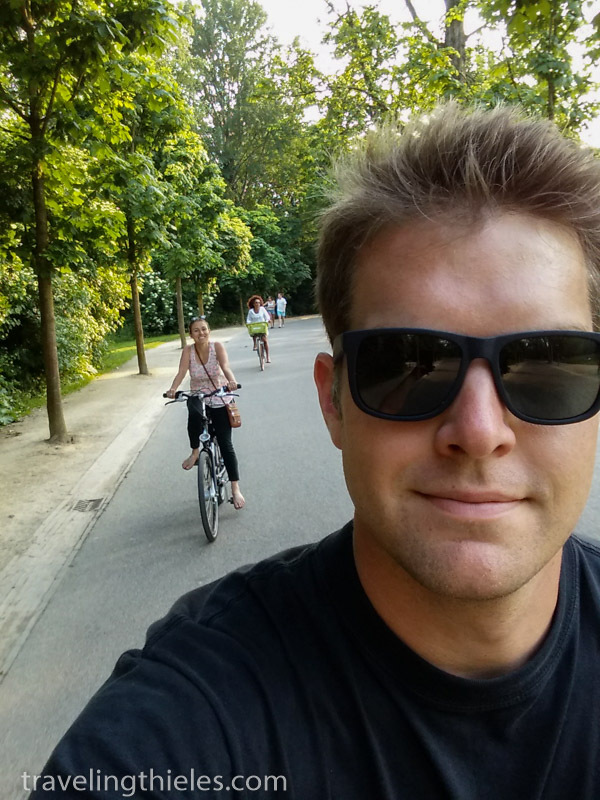 Unfortunately, one of our most anticipated daytrip destinations – the Keukenhof gardens – had just closed for the season. These are proferjes (sp?) or sweet little pancakes fried in a cast iron pan (ju st like the ones used for tokoyaki in Japan). Served with a big ‘ol hunk of sweet, rich Dutch butter and plenty of powdered sugar, they are a delicious treat. Mayne in particular love, love, loves!! 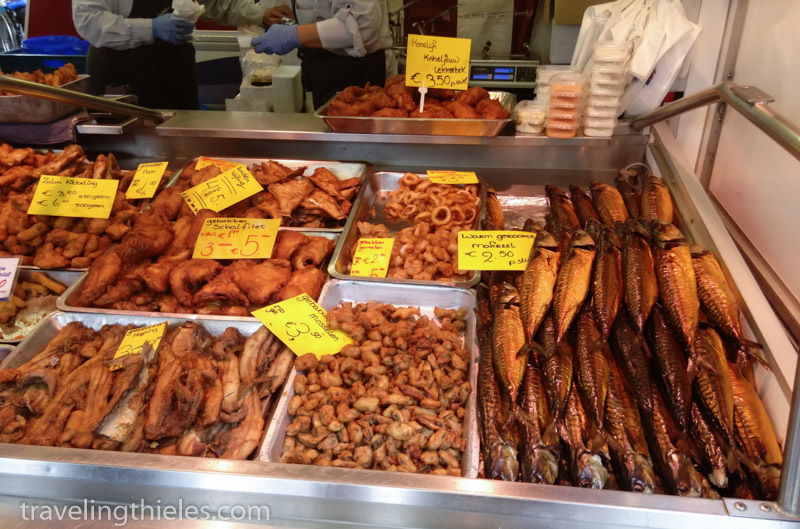 the many varieties of smoked and fried fish that are always on display in the Dutch markets. Gotta try them all! 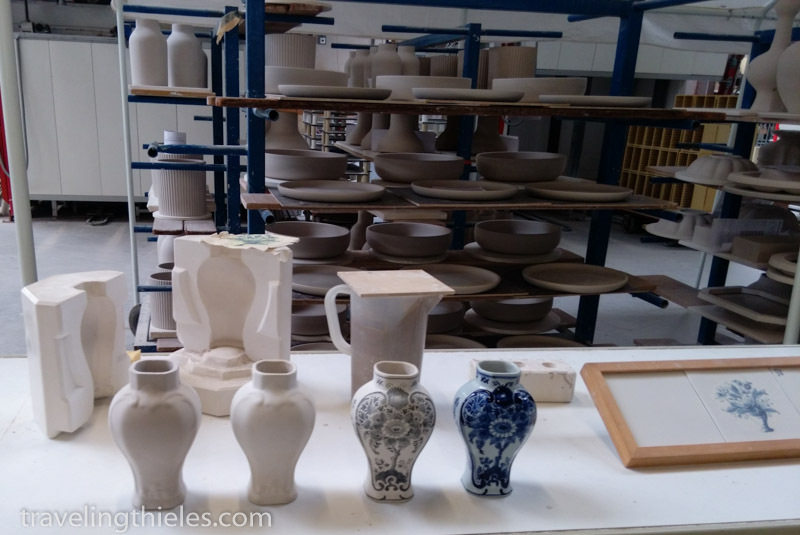 In Delft, we visited the Royal Delft pottery factory for a tour of how the expensive pottery with distinctive blue decorations is made. 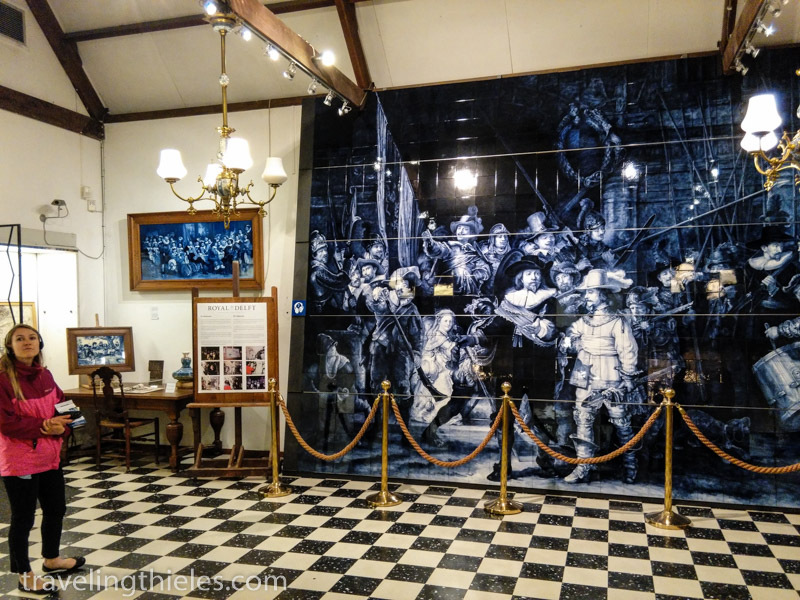 This mural of the Night Watch was made from hand-painted tiles and must have taken awhile. Steps on making the pottery.. The stain which starts out in shades of grey eventually turns to blue during the firing process. 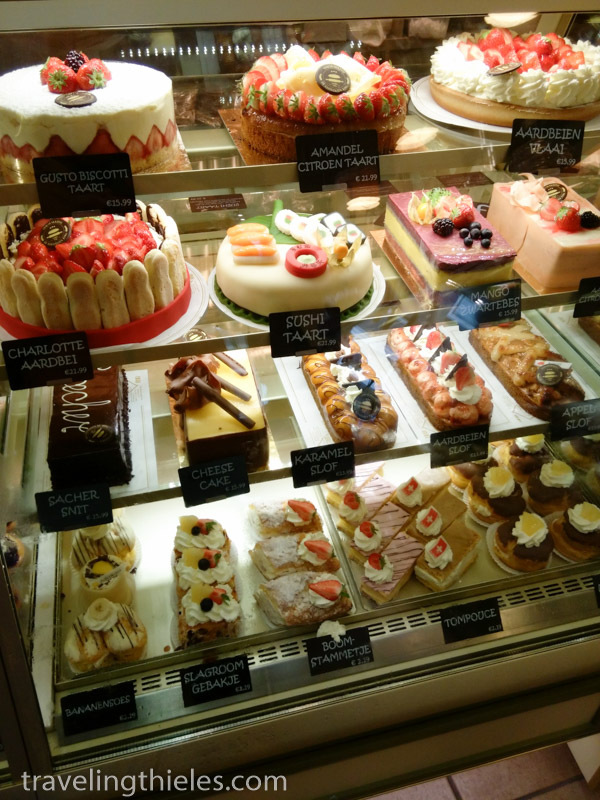 A mouth-watering selection of cakes and tarts at one of the oldest bakeries in Delft. 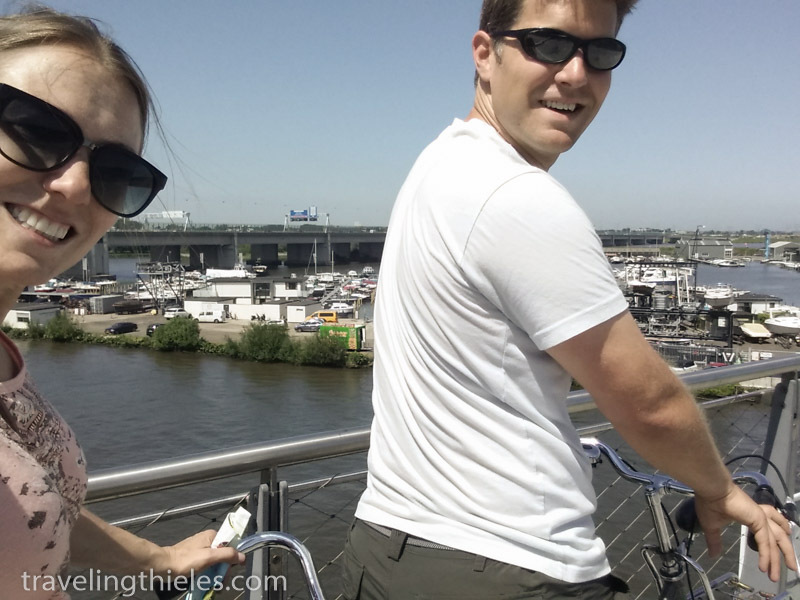 We also hopped on bikes for a couple of day trips from the capital. 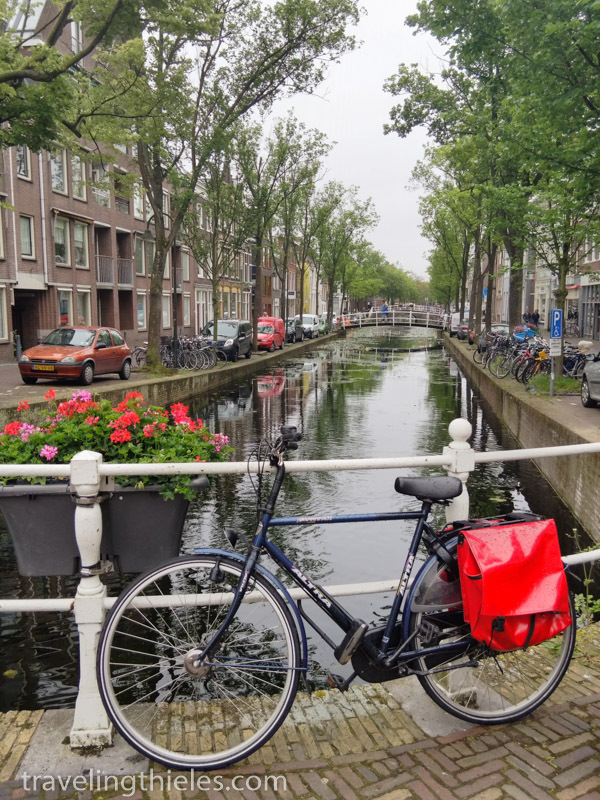 While Amsterdam is fascinating and completely unique, the canal-laced countryside of the Netherlands is what really drew us in. 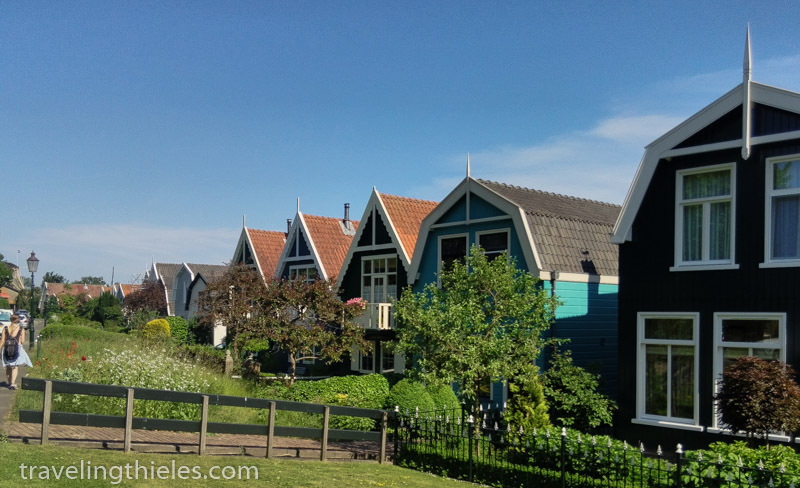 We loved how easy it was to navigate our bikes all around Waterland and the parks west of the city, as well as the novelty of biking down a smooth country path through bucolic fields of dairy cows and wild flowers while simultaneously passing boats in their highways of water. 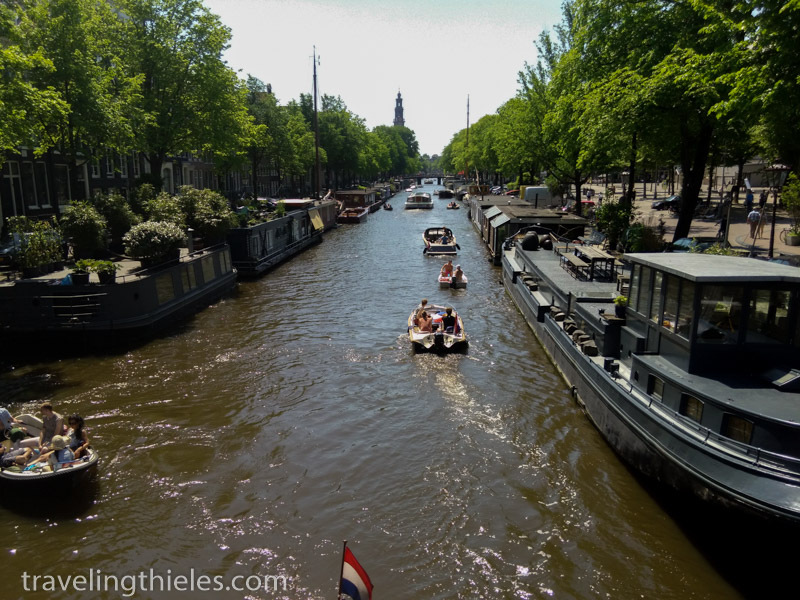 The Dutch, it seems are just as at home in the saddle or on the water as we in the states are in our cars. 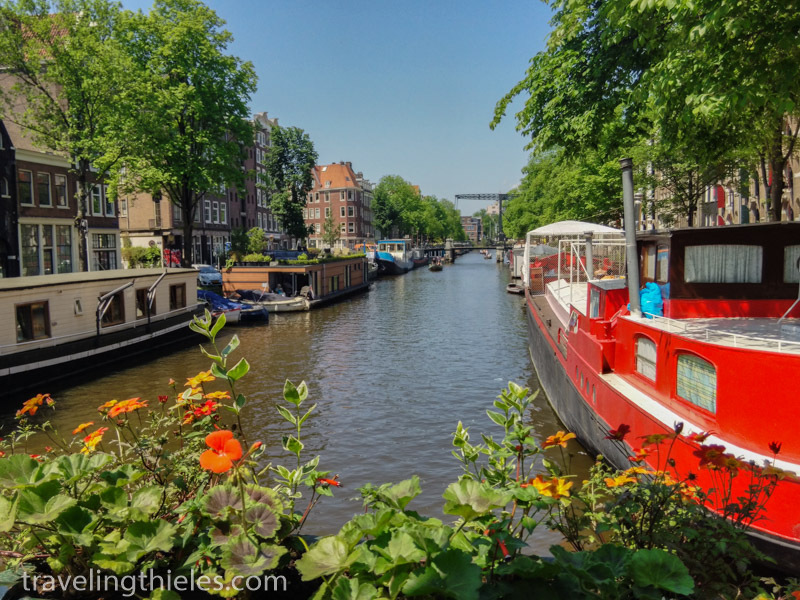 Since canals are everywhere, it’s no surprise that there are a correspondingly large number of bridges of various types. 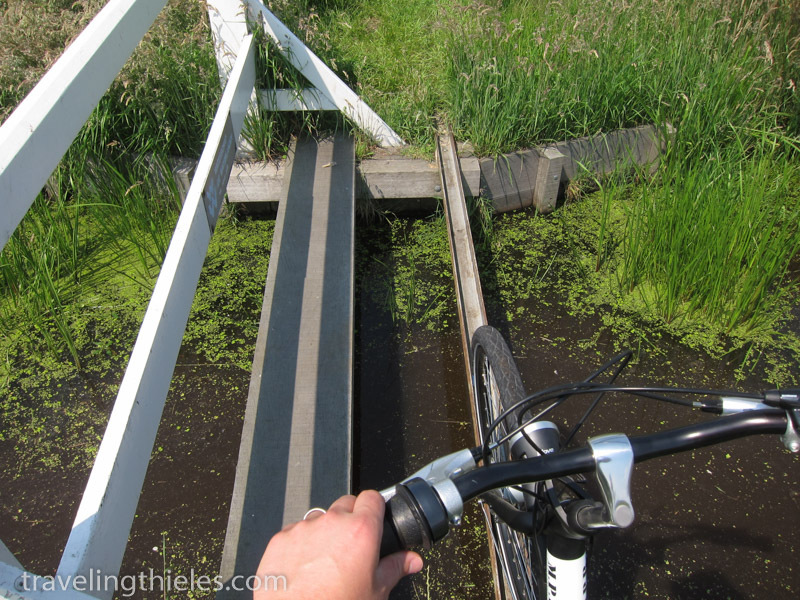 This one was for designed for walking a bicycle across with ease. 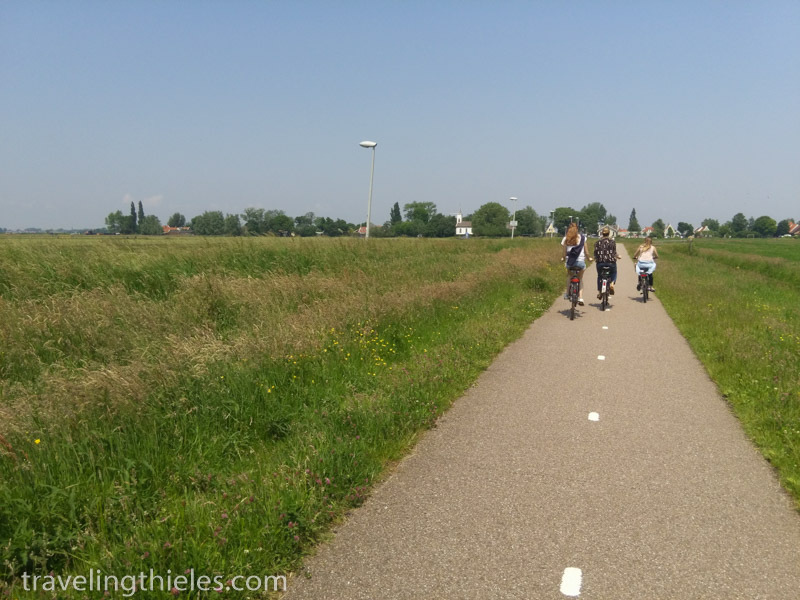 Bike paths are as common as car highways, always flat and usually well sign-posted. If a road bike was available you could cover some serious distance here. 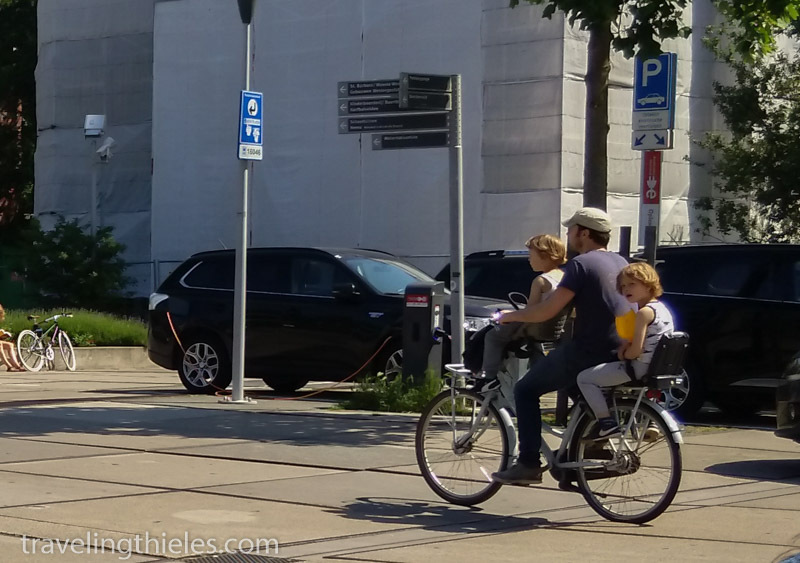 Just like we had seen in Vietnam, the Dutch manage to fit almost everyone and anything onto their bikes. These bikes were particularly enticing since a least someone gets to be a passenger. Steering is probably more like a boat than a bike though. 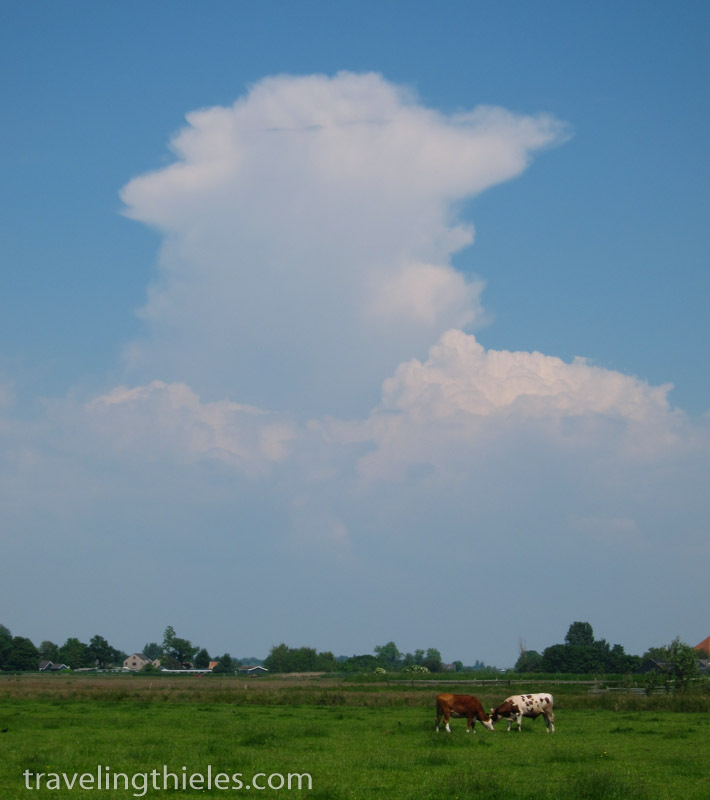 Two bulls butting heads, thundercloud in background. 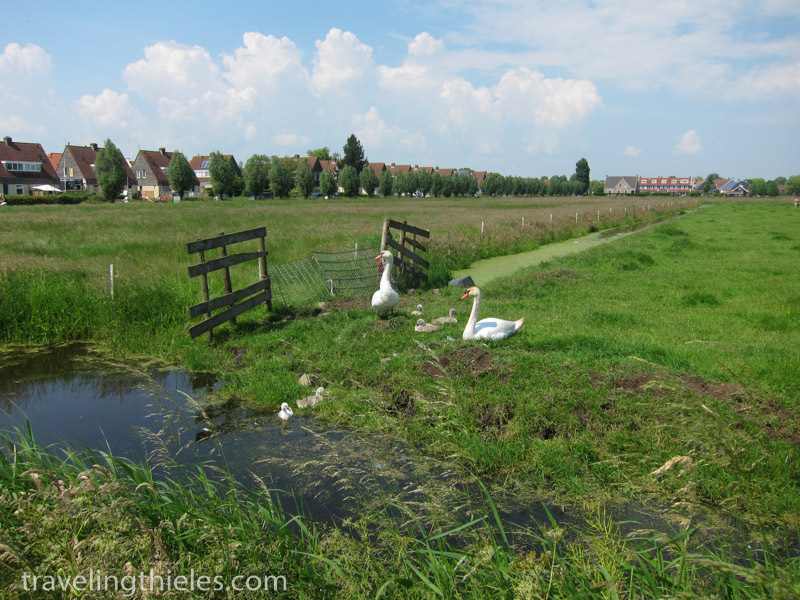 In Waterland, the residents seem equally as likely to take a boat to work as a car or bike. 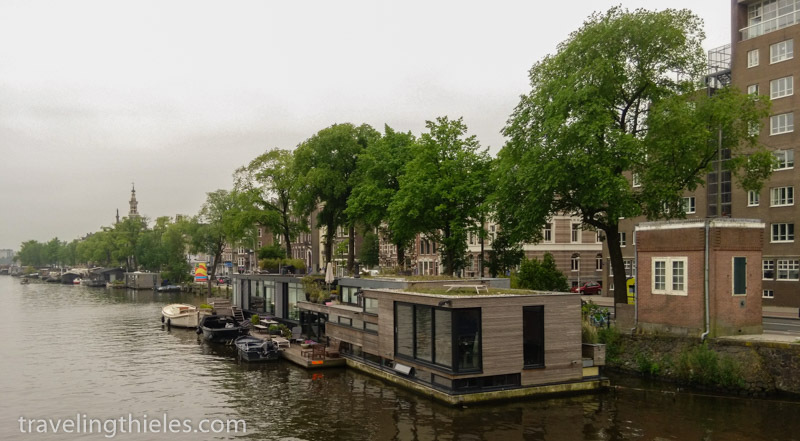 There are plenty of houseboats throughout the low countries. We wondered if they were just used during the summers or throughout the year. 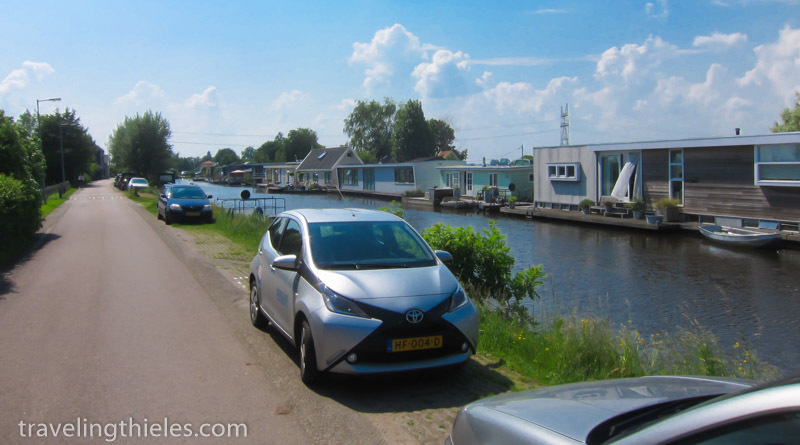 Stopping for a break in the town of Durgerdam. 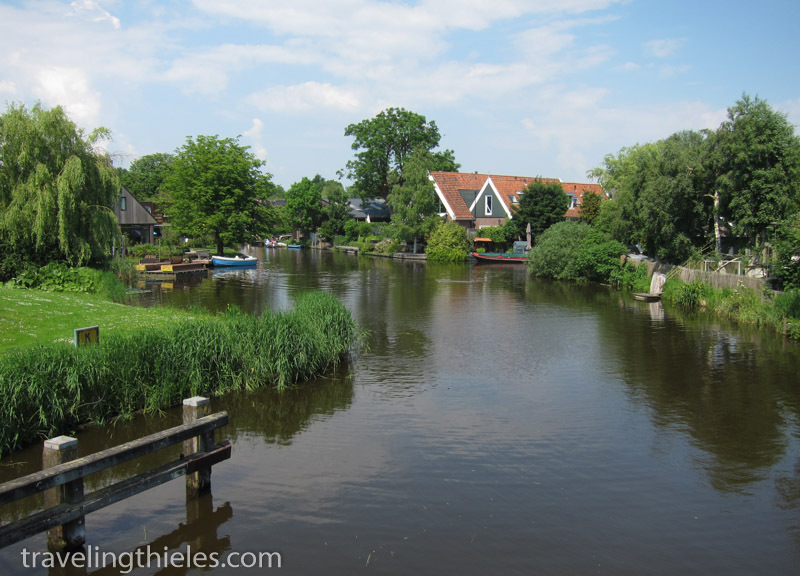 This quiet little town would make a great spot for stretching out on a hammock and wasting away a summer week. 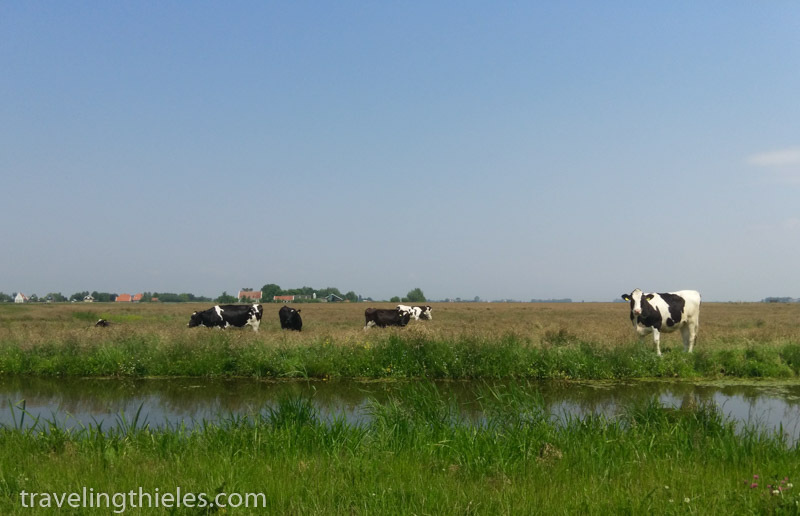 Pastoral landscapes and dairy cows abound in the Netherlands. The cows look happy, fat and lazy. 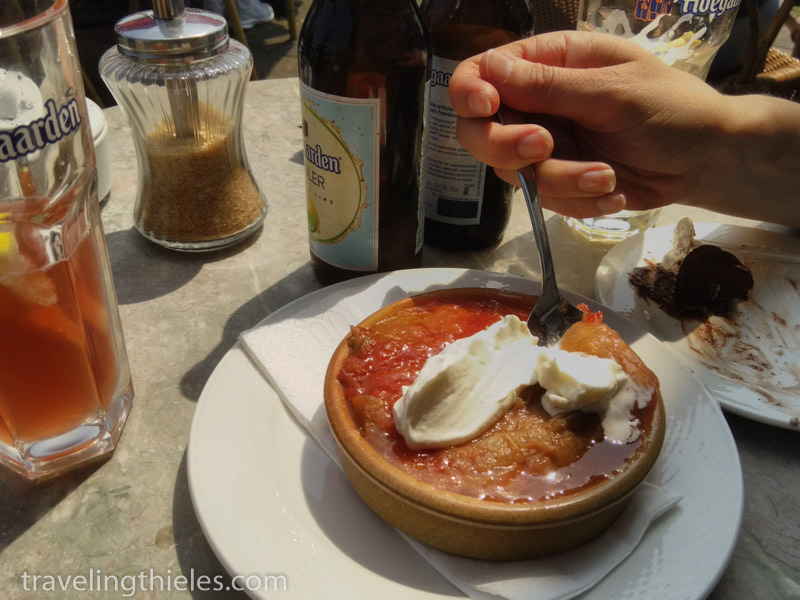 We stopped on our ride through Waterland for some refreshing radlers (lager beer mixed with fanta) and this delicious treat – rhubard crumble with fresh cream. 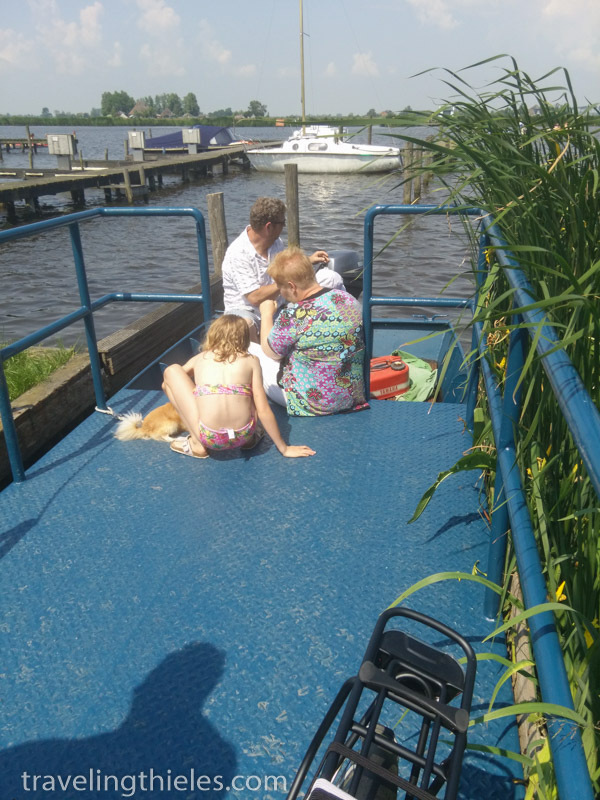 It was hard to get up and leave..
At one point, we took a shortcut between towns and had to pay the ferry many one euro each to take us across a canal in this teeny little ferry. It seemed like he would have done it for free for the fun of it if we had asked politely. 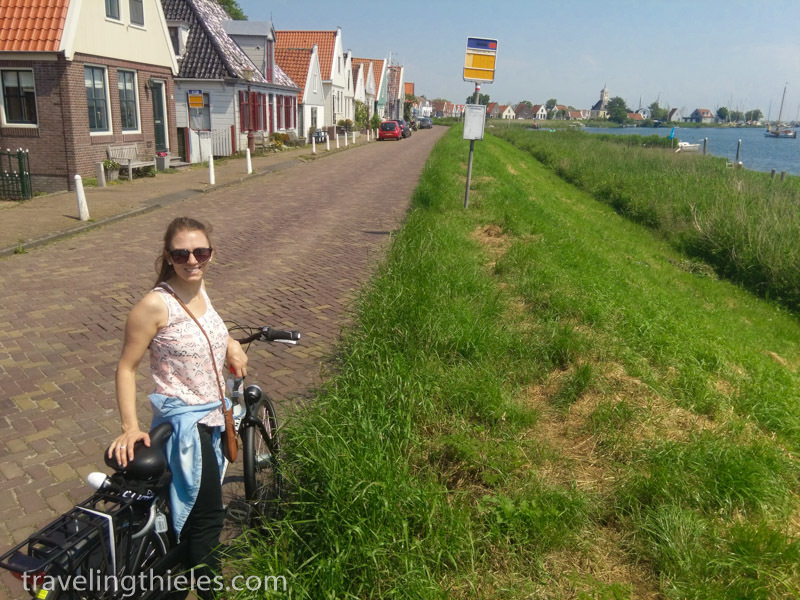 Travel by bike is better in the Netherlands than any other country we have been to. On the tandem, as cheesy cute as a couple a get. Luckily, no marital strife occurred as a result of our time together (only fun ). 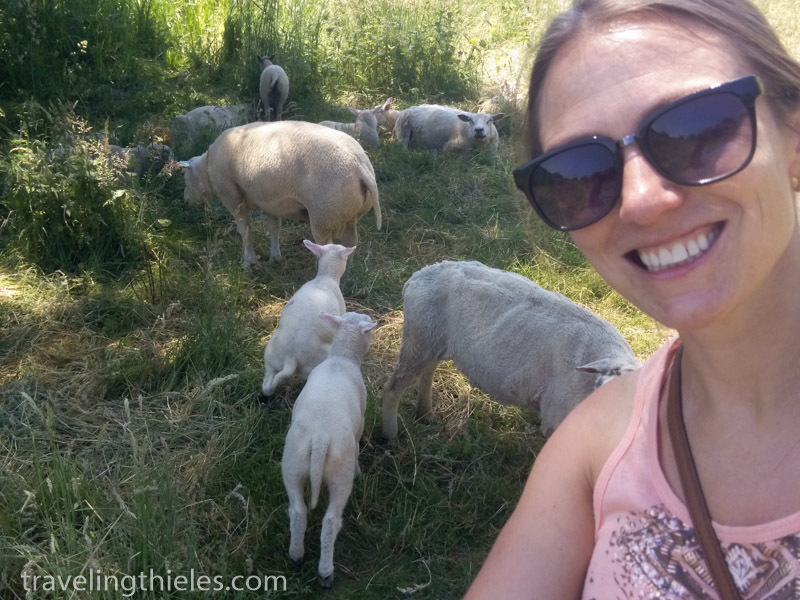 We biked through some land with these sheep grazing. Elisa wanted to capture a pic of these two little guys who were pretty gung-ho about getting some of moms’ milk! 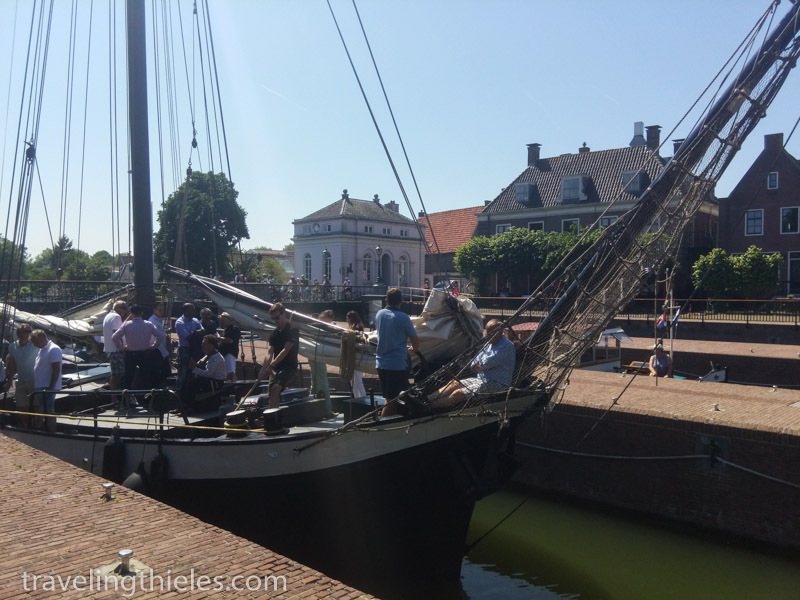 Muiden has a neat system of locks which we walked operate for an hour or so over goblets of tasty beer while perched canal-side at our café table. 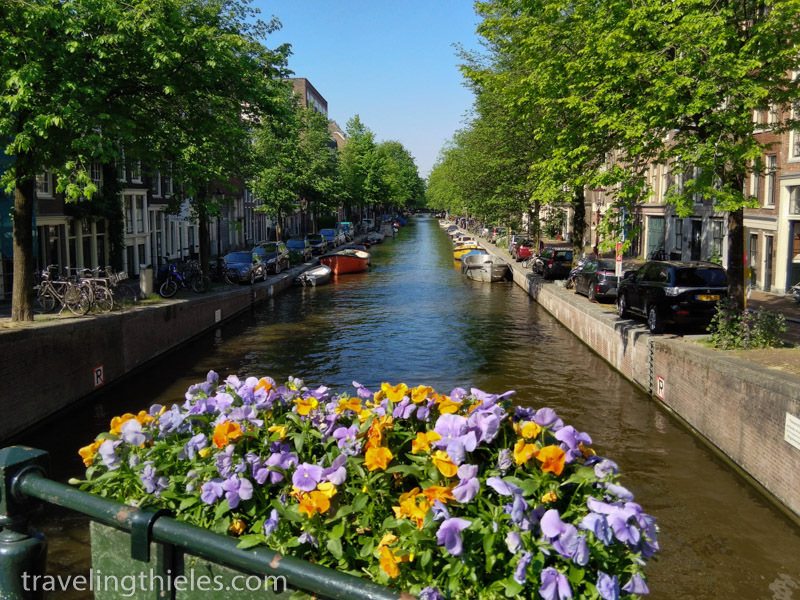 We learned that the due to their extensive system of locks, the Dutch in Amsterdam have managed to stop numerous invasions over their history by flooding the farmlands all around the city. 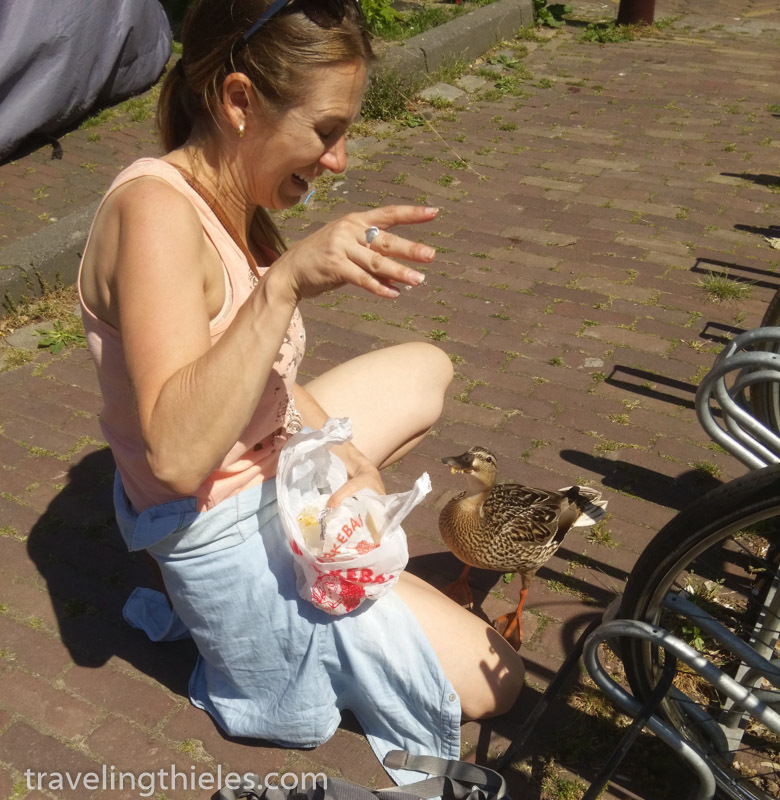 Elisa tried to hand-feed some durum kebab to a local duck but was shocked when he took it greedily and even tried to get a bit of her finger as well.. 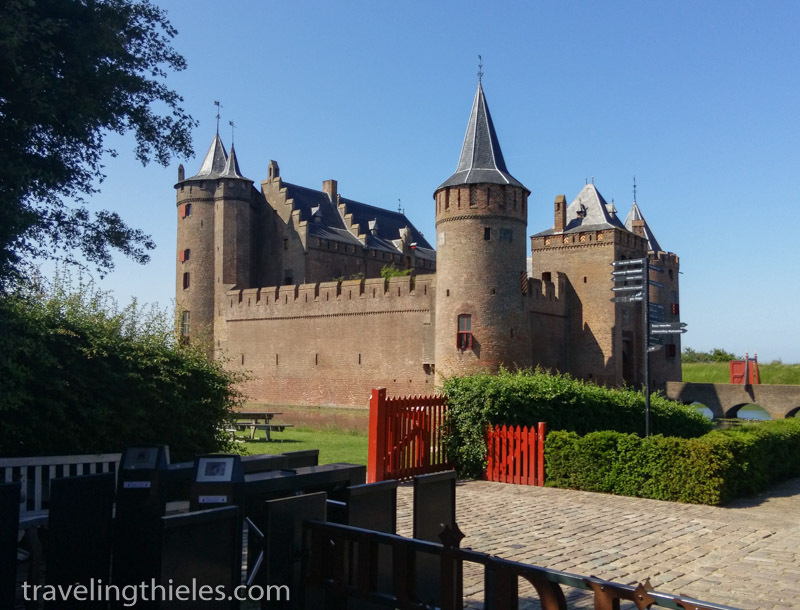 The castle in Muiden. We didn’t go in because of the steep entrance fee (just a bunch of bricks after all), although it was about as perfect as castle as could be. 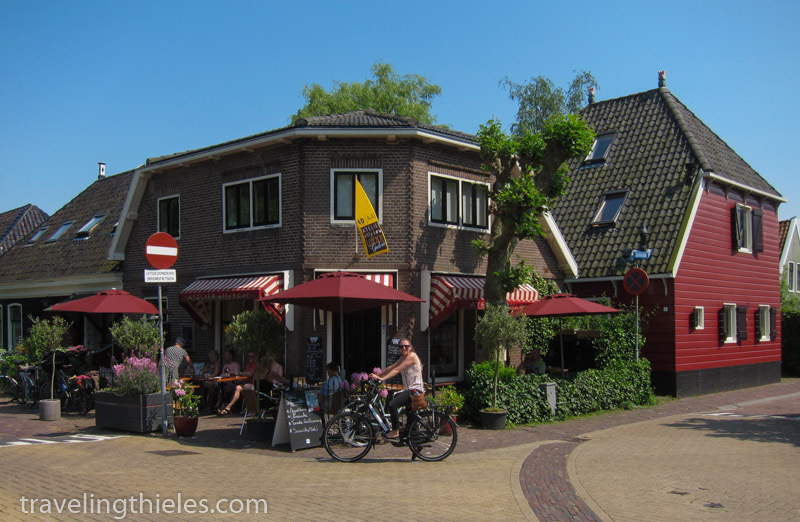 Street view in the town of Weesp, where everyone seemed to be enjoying the warm summer day. 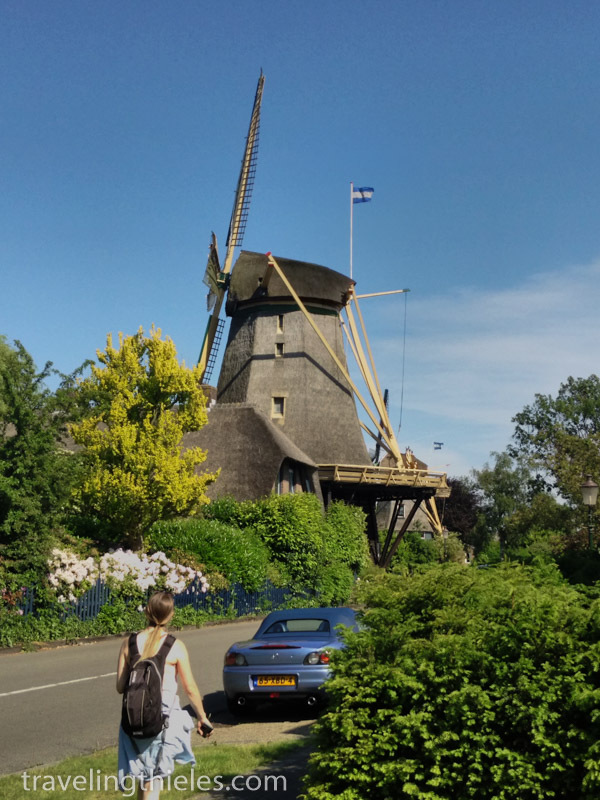 Old mill in Weesp, this one was a private home with a nice flower garden surrounding it. 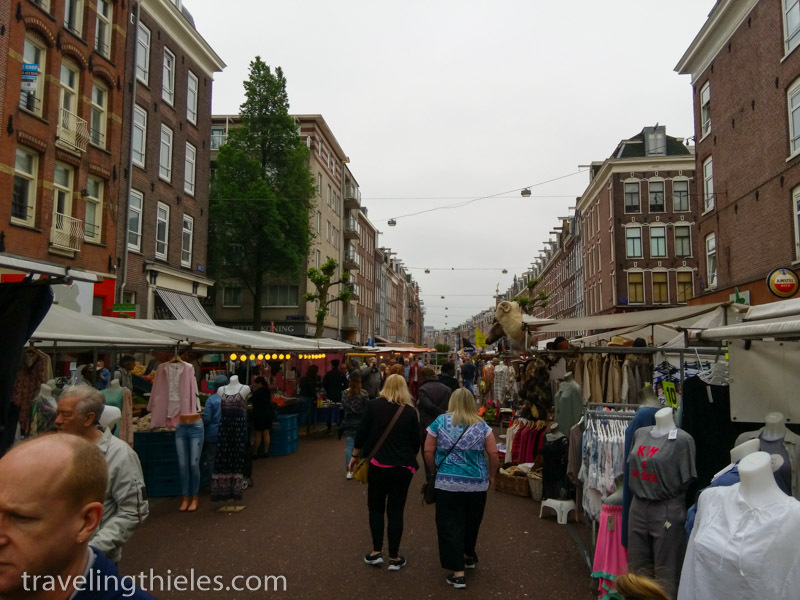 One of many street markets in Amsterdam. 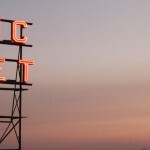 Some are more local (and usually better than others). 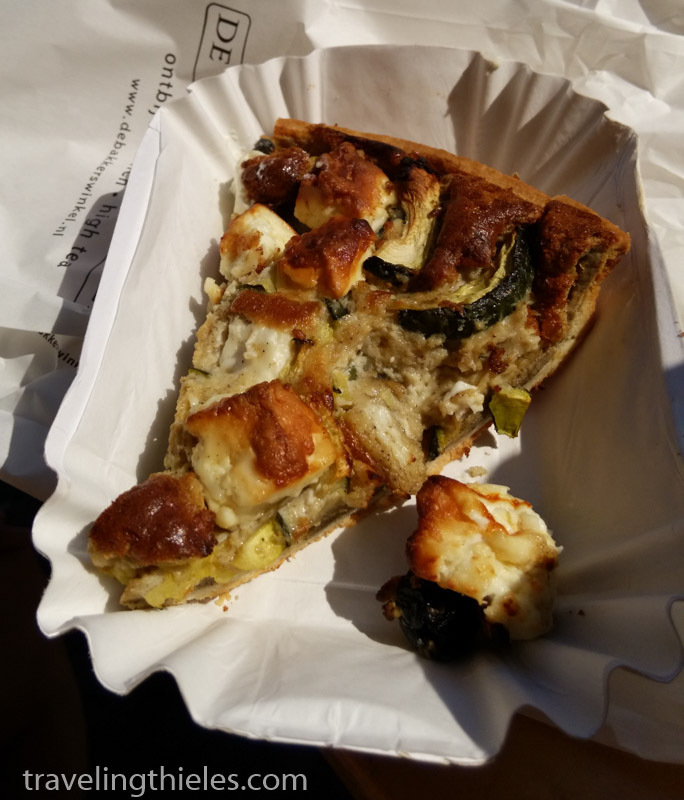 This one was great for the fresh stroopwafel cart..
A delicious quiche from the Sunday food market in Westerpark. 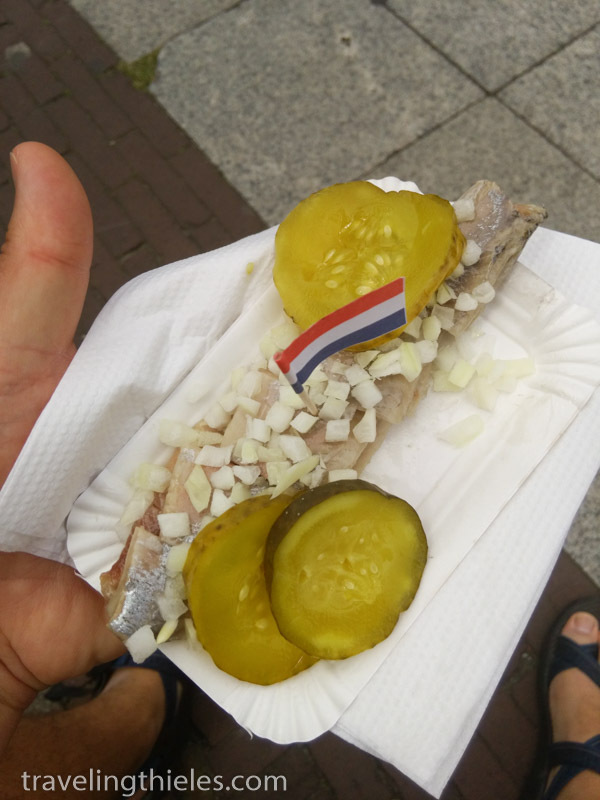 Awesome pickled herring common on the streets in Holland – dirt cheap for a euro or so. It’s not the super salty and vinegary stuff you find bottled in the states, only fresh and slightly briny wholesome fish flavor. 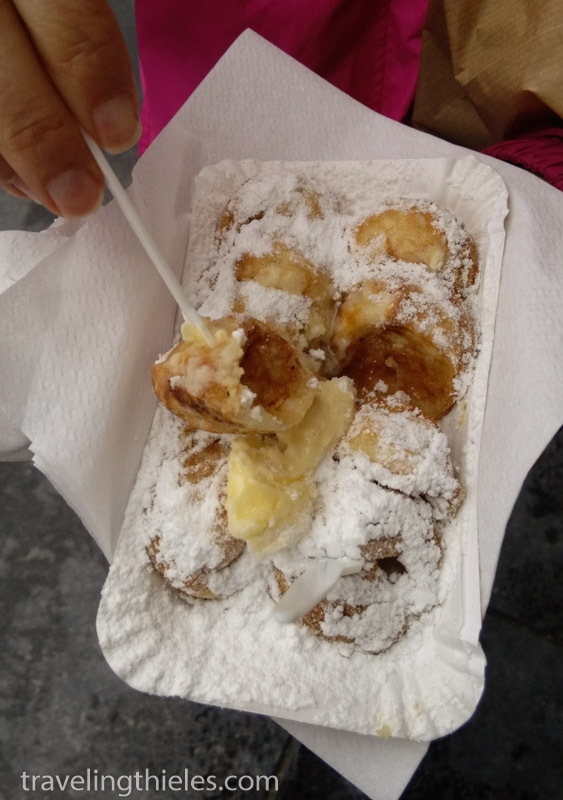 These are called “kibberling” in Dutch and are a common street treat. Not quite as tasty as the pickled herring but still good. 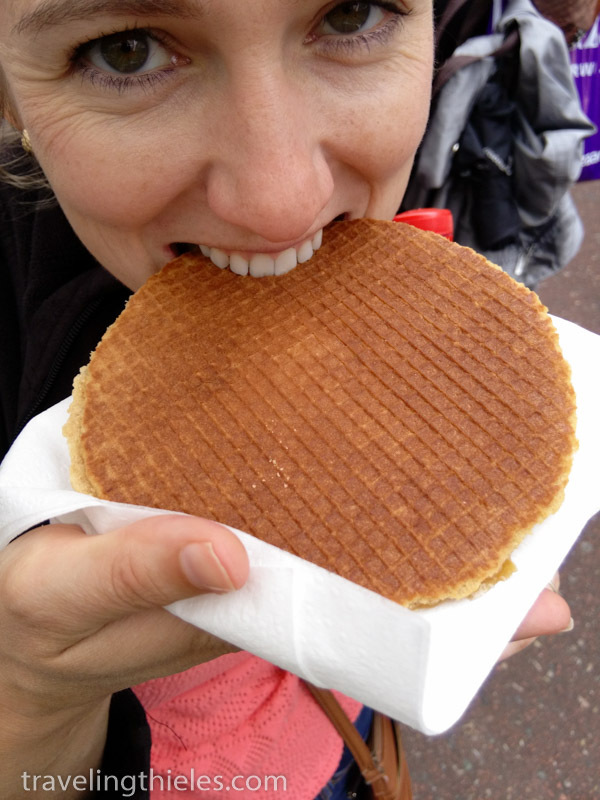 Fresh-made stroopwafels are a must try! It’s two very thin, crispy yet chewy waffles with a sweet sauce like caramel in between. 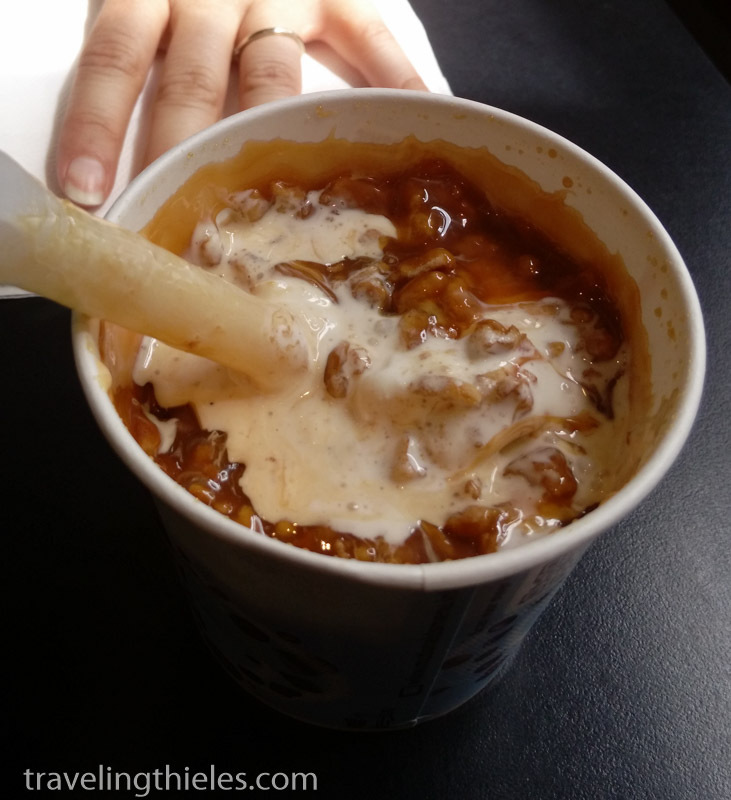 In the McDonalds in Holland they have a unique flavor of McFlurry – the stroopwafel. 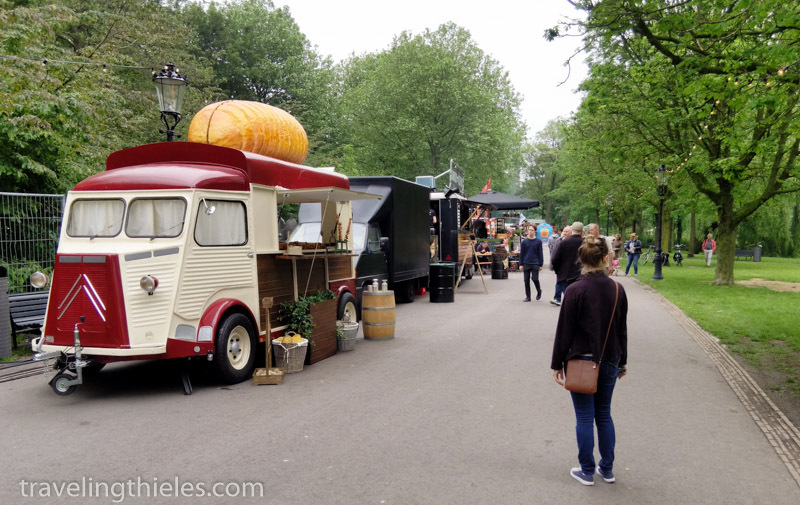 Food trucks have crossed the pond to Europe and are starting to show up everywhere. 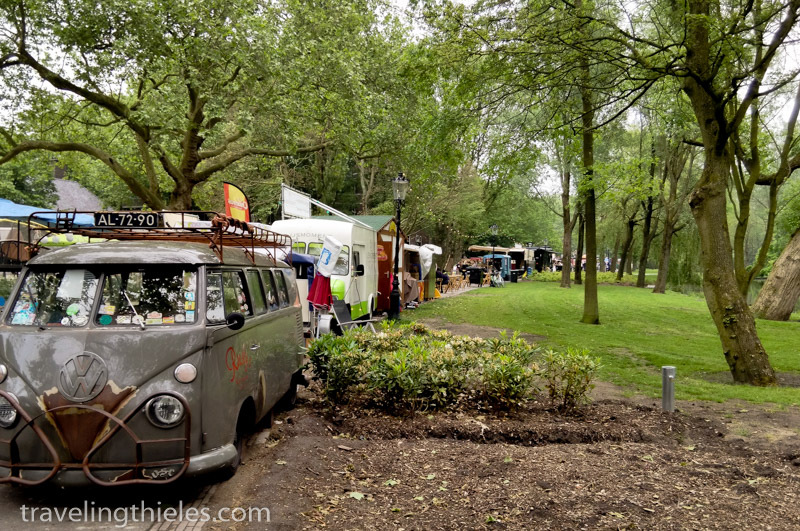 This was a food cart festival in Oosterpark which had some very eclectic assortment of options for dining. Funky old trucks are a popular choice for food trucks it seems. 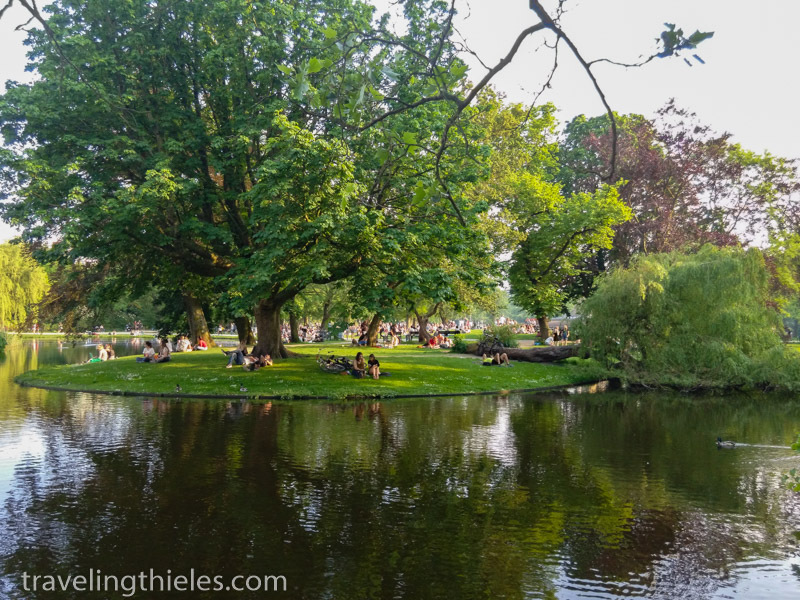 Island in the middle of Vondelpark, Amsterdam’s most famous park. 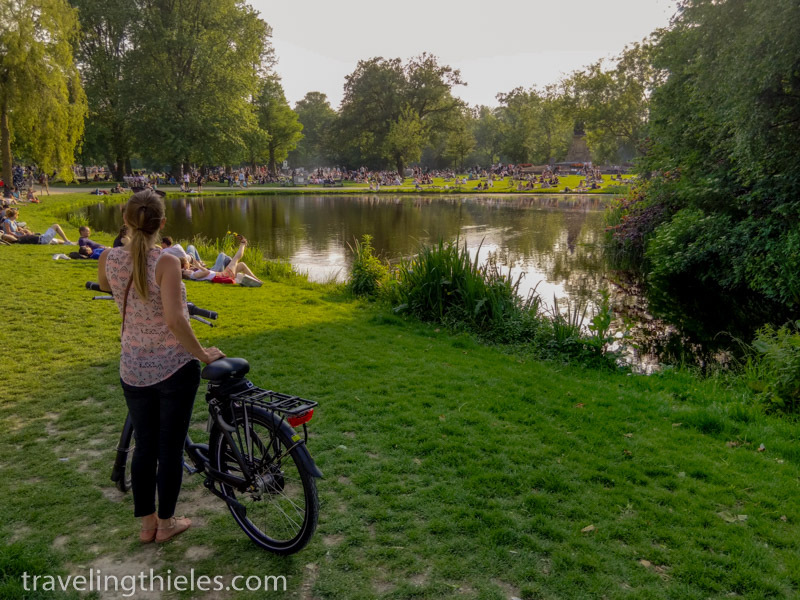 The Vondelpark was incredibly crowded when we biked through it one Saturday. We had never seen alums this large. They look much better planted en masse like this. 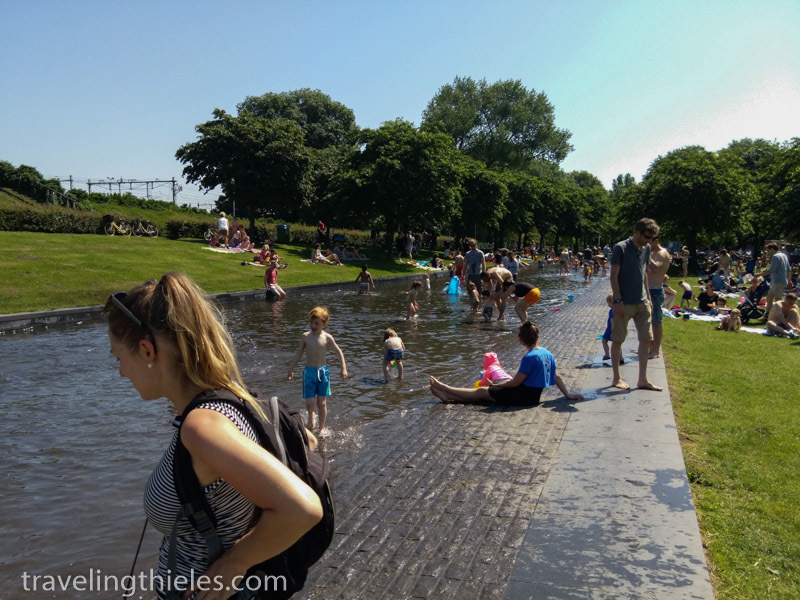 Family fun in Westerpark on Sunday. 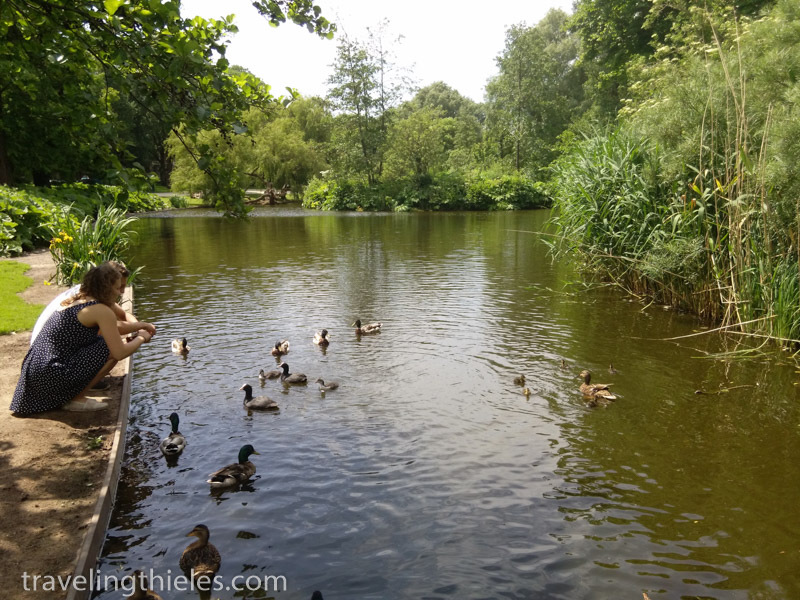 So many people were out enjoying the sunny weather. 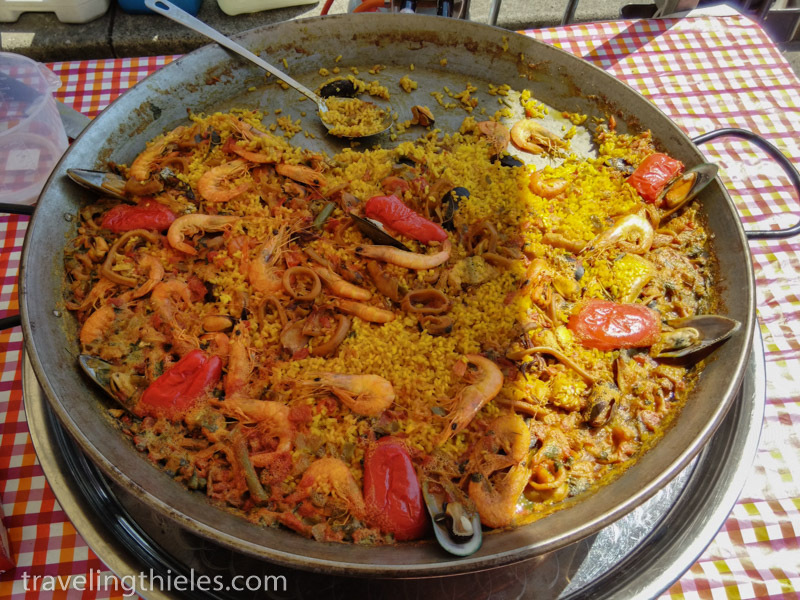 Paella at the street food market in Westerpark. Smelled and taste authentic, which is to say just okay. 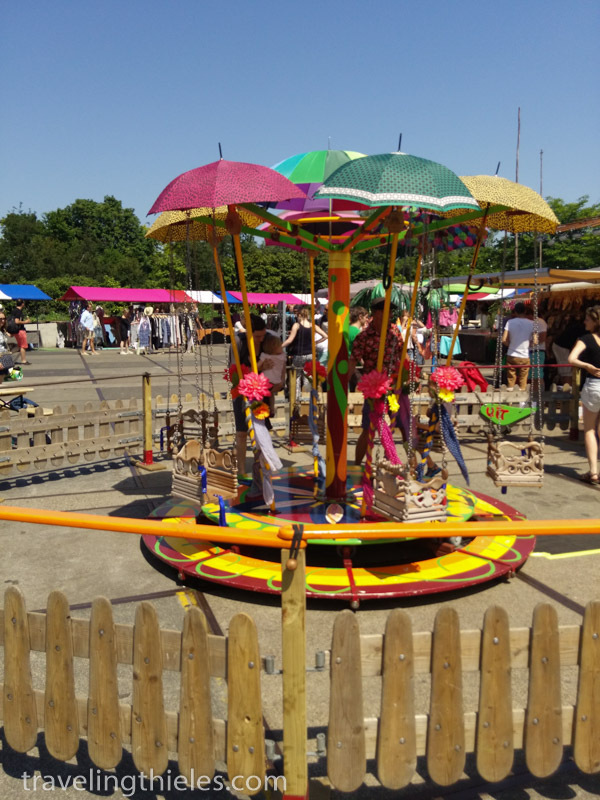 We noticed this fun looking swing ride for the kiddos. Wished we were small enough to ride. 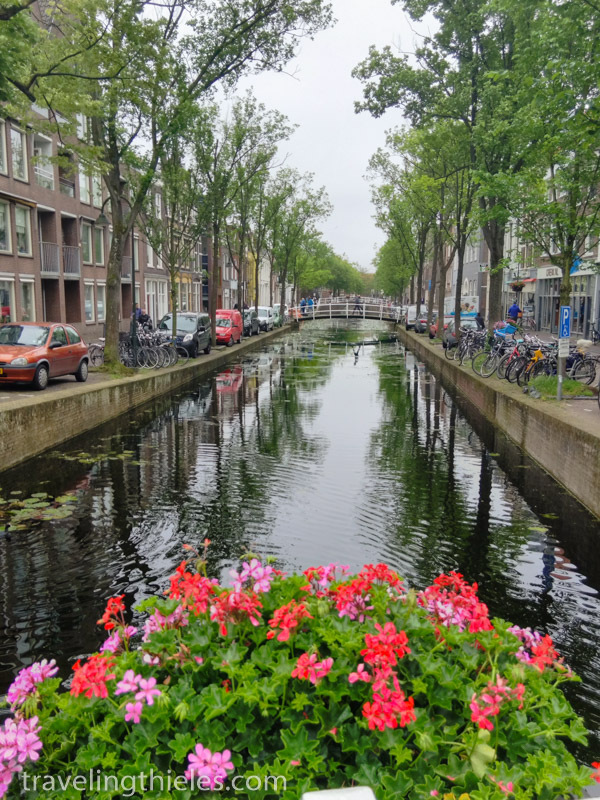 The Jordaan neighborhood in the western canals of Amsterdam is famous for its many plants and gardens. 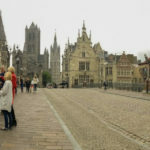 We enjoyed strolling through the quiet and pretty streets several times. 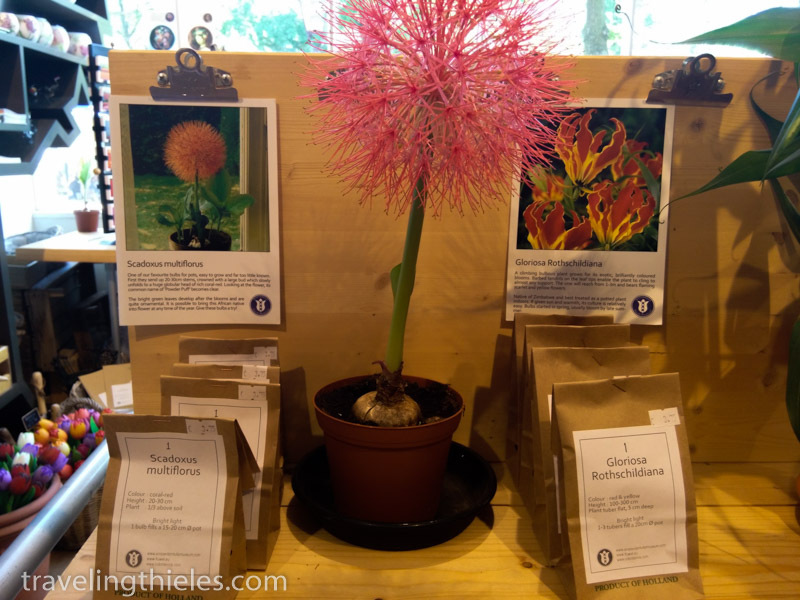 We visited the gift shop of the tulip museum for some souvenirs (there is a museum for everything in Amsterdam). Noticed these cool bulbs. 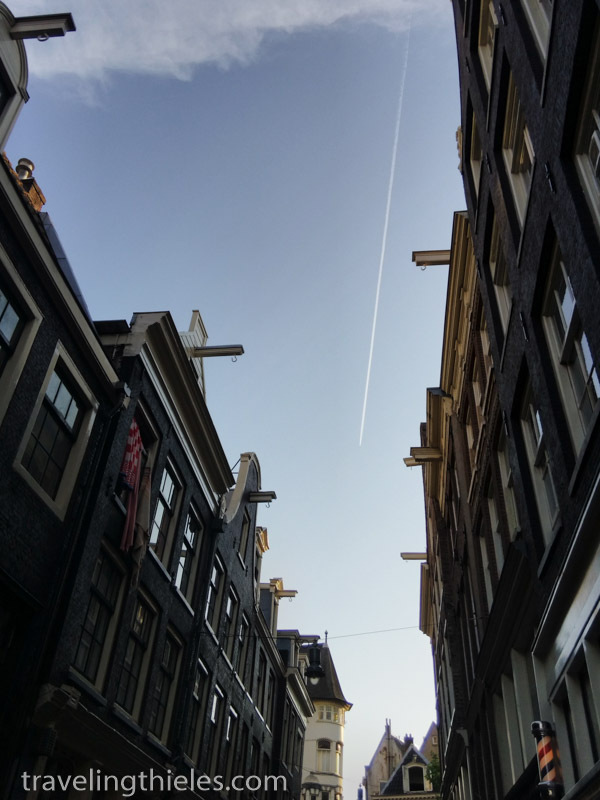 Looking up at the old historic buildings in Amsterdam, one often sees these posts where pulleys can be attached for hauling up heavy objects to the upper floors. Staircases are typically very steep and narrow so the very practical pulleys still see use by the locals. 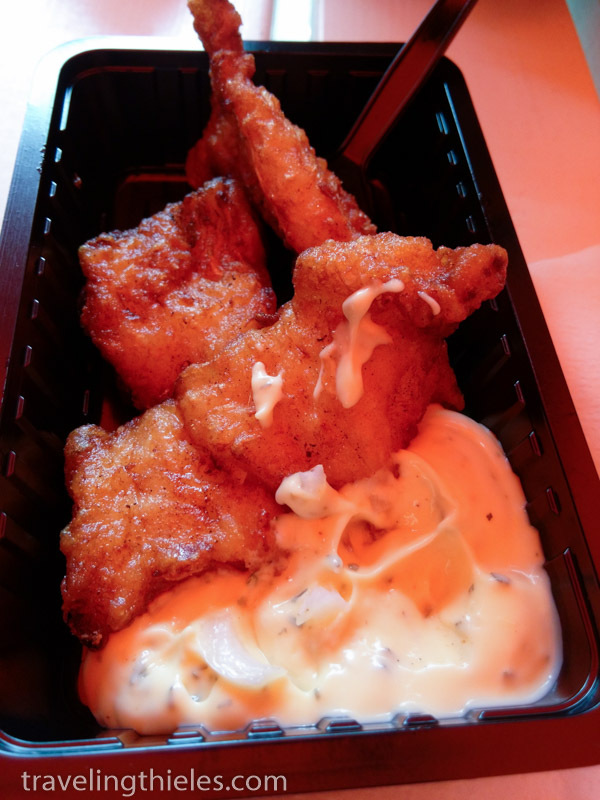 Our favorite sit-down restaurant in Amsterdam is “Moeders” restaurant. It translates to mothers in English (surprising, right?) and the menu contains all the homestyle dutch cooking one could desire. Very kitschy inside, when the restaurant opened, patrons were asked to bring framed photos of their moms and a piece of silverware to donate. Now the walls are completely covered with photos of moms and all the place settings are as eclectic as a flea market. 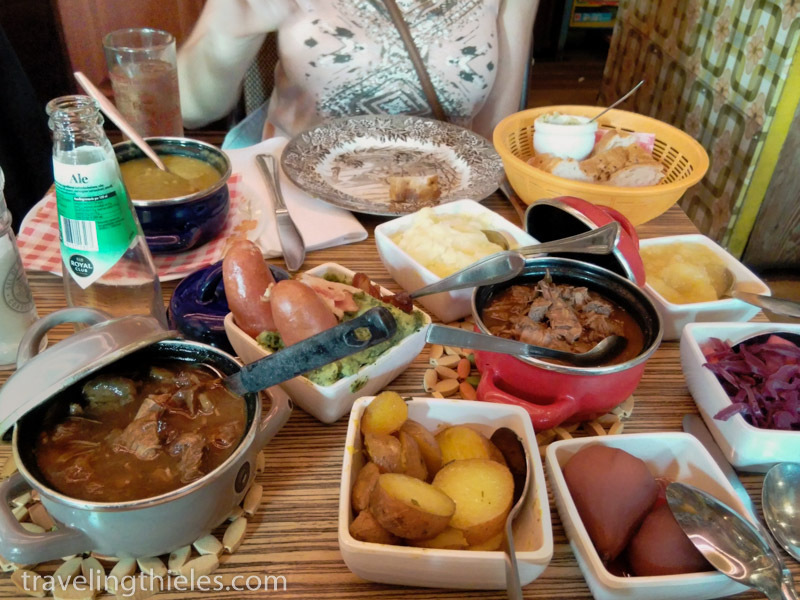 This was our sampler order which was an absolute feast of hearty dutch fare. Famous sign on the museumplein. Took awhile to get this photo right – hope you enjoy. Lots of buildings in the city have settled over time, and some like these are surprising in that they have not yet fallen over. 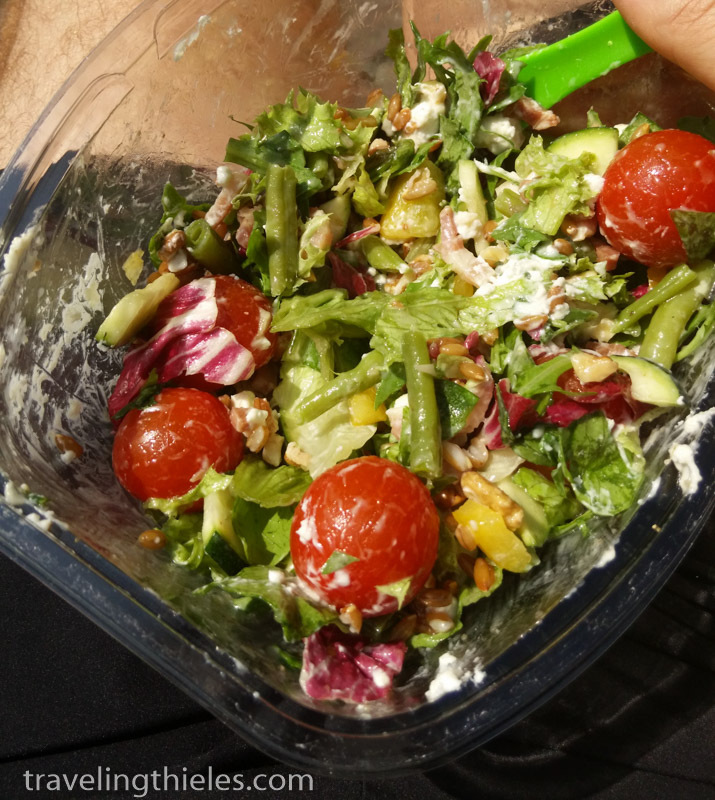 Another delicious Albert Heijnen supermarket salad. We were delighted that our favorite European grocery chain is also in the Netherlands. Overall the Netherlands is still Mayne’s pick for best country in Europe to live in, and probably the second pick for Elisa after Belgium. 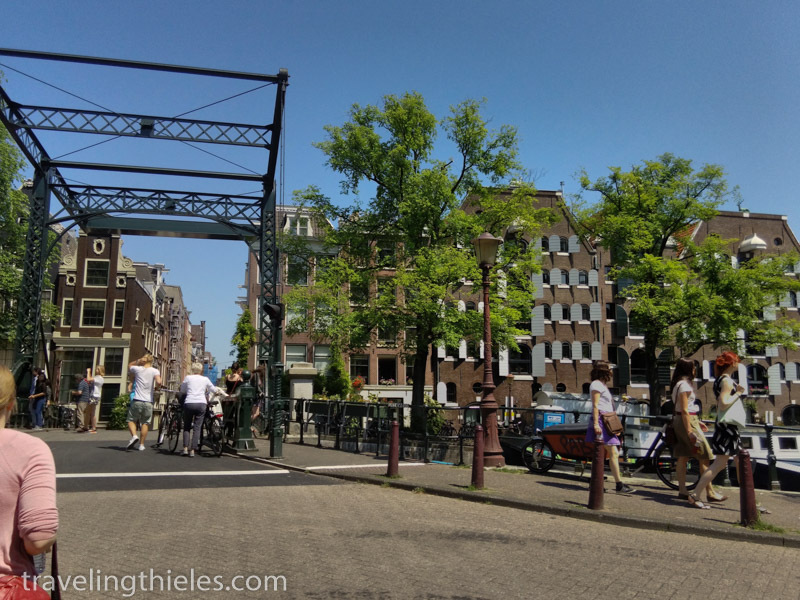 It has a similar feel to Portland, Oregon (another fantastic city and on our short-list for next year) what with the temperate weather perfect for flower cultivation, ease of access to nature, loads of bikers, good beer and high quality of living. 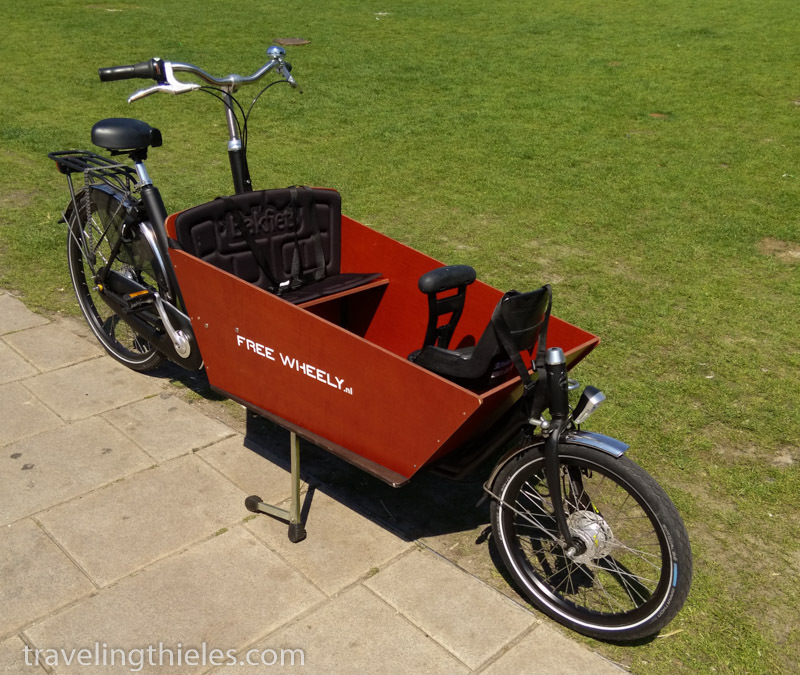 Nearly all the Dutch we met were friendly and getting around was a breeze. We really hope to return for a longer stay in the future.